When it comes to men’s wedding rings, the traditional plain gold band is being given a run for its money. 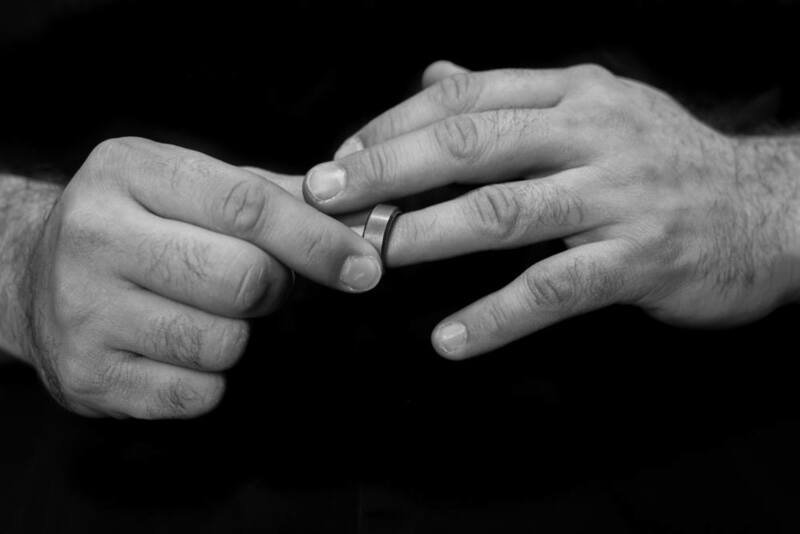 Men are using their rings as a way to display their personal style–some men are even sporting engagement rings prior to their nuptials! 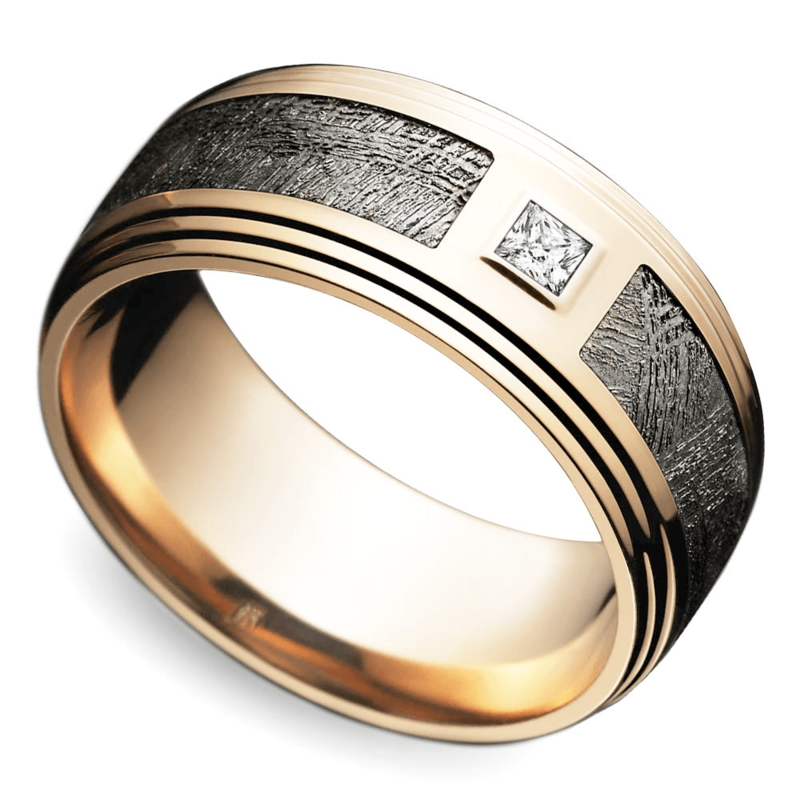 Wedding bands often feature rugged, masculine touches, such as wood inlays or dark, cool metals. But for those men looking for something truly out of this world, there’s the stellar look of meteorite. At Brilliance, our meteorite rings include pieces of genuine Gibeon Meteorite, an iron-nickel meteorite that is believed to be around four billion years old. This grey metal has a space-age, modern look, but it can easily suit a classic design for a unique wedding band he’ll love to wear. 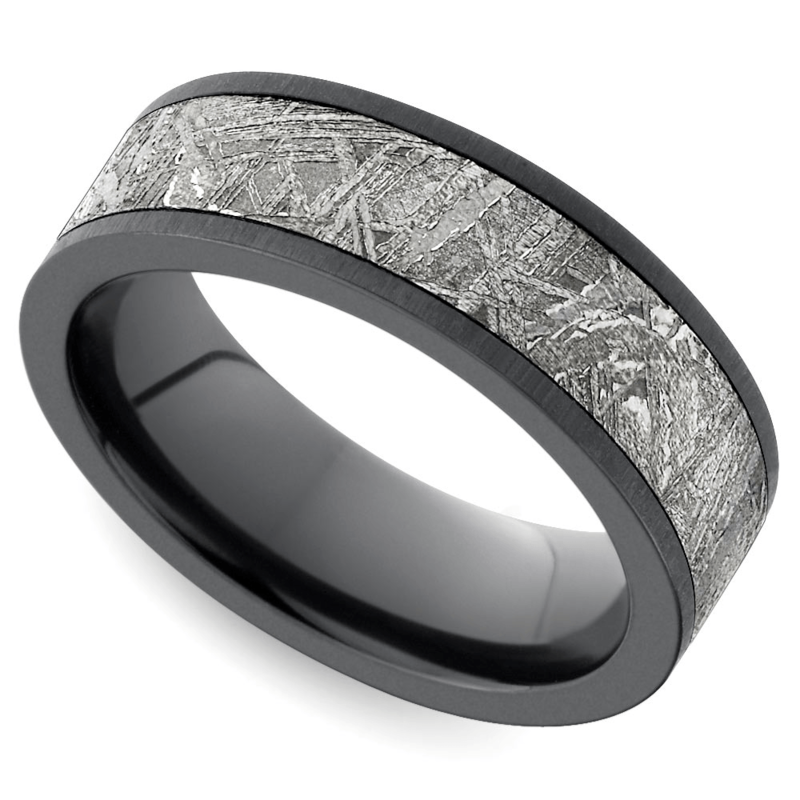 Take a look and you’ll see that there really is a meteorite wedding band for every style. He only has five shirts, and maybe two pairs of pants. His apartment is sparsely decorated – clean lines, maybe a photo or two. His look may be classy and modern, but it’s simple above all else. This is just the type of man who will love the clean, cool look of a meteorite ring with zirconium. The thin black outline frames the meteorite center inlay, making the grey metal stand out. This ring style comes in either a flat shape (pictured), or a rounded shape for a more classic look. But no matter which one he chooses, the simple look of this meteorite ring will certainly suit his clean style. We all know that guy who is an old soul at heart. He gets along great with your parents and your grandparents. He prefers a quiet night in to an evening at the club. And when it comes to his style, he prefers the styles of yesteryear (you’ve seen him wear a jacket with elbow patches – unironically). This man’s wedding ring needs to have an antique feel coupled with the style of the modern age. And this meteorite ring has exactly that: The light cobalt band is less intense than a darker metal, but the black grooves lining the meteorite inlay provide a sleek, aged look. This man knows about all of the hottest spots in town before anyone else you know. He knows all of the up-and-coming bands, the coolest new restaurants, even the latest fashion trends, and he’s constantly helping his friends keep up with the times. Shouldn’t his wedding ring be a step ahead too? The Brilliance meteorite collection has a number of striking, original designs, from the segmented meteorite set in cobalt (pictured) to this square beveled ring. Both these designs feature that unforgettable meteorite inlay set in cobalt for a shining, silvery look. And no matter which one he chooses, these incredible rings will have people stopping him on the street to admire them. Who knows? He may just start a new trend. He’d rather spend time fishing than doing anything else. He practically owns every item from the local camping store. And when it comes to his style, he’s rugged and rough around the edges. 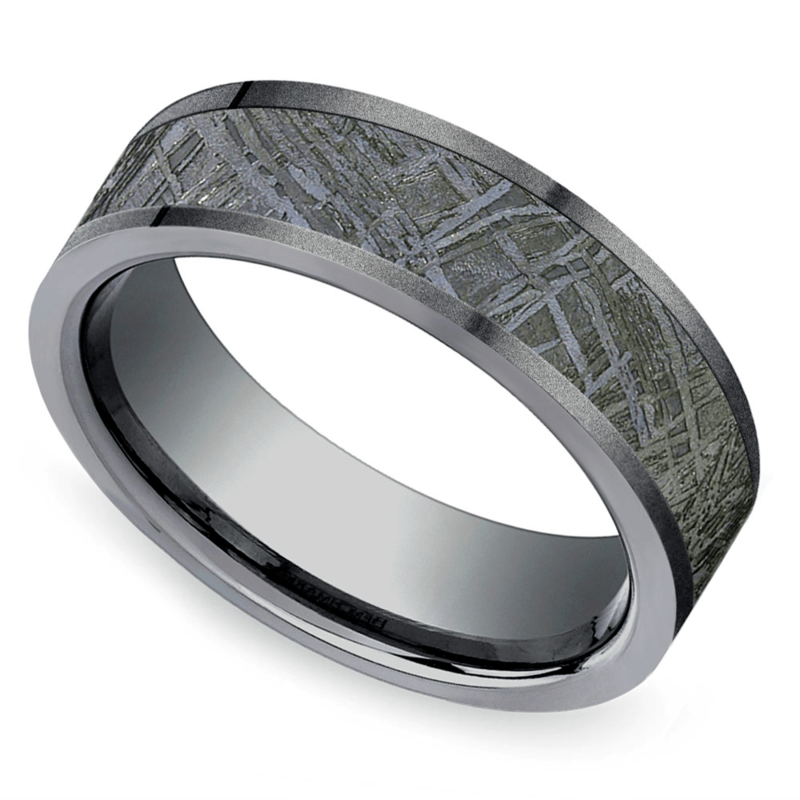 Make sure his wedding ring sports that same rough feel with this meteorite ring set in sandblasted titanium. The sandblasting technique makes this particular ring a little different than the others we’ve seen so far: rather than a silvery-grey meteorite, this inlay is a beautiful black color. The sandblasting also diminishes the shine around the titanium, which is perfect for a guy who likes the rugged beauty of the outdoors. He is the life of every party. He works hard and plays harder. His confidence and bright smile never seem to dim! This is the man who likes a little pizzaz in his style and is unafraid to take some fashion risks. 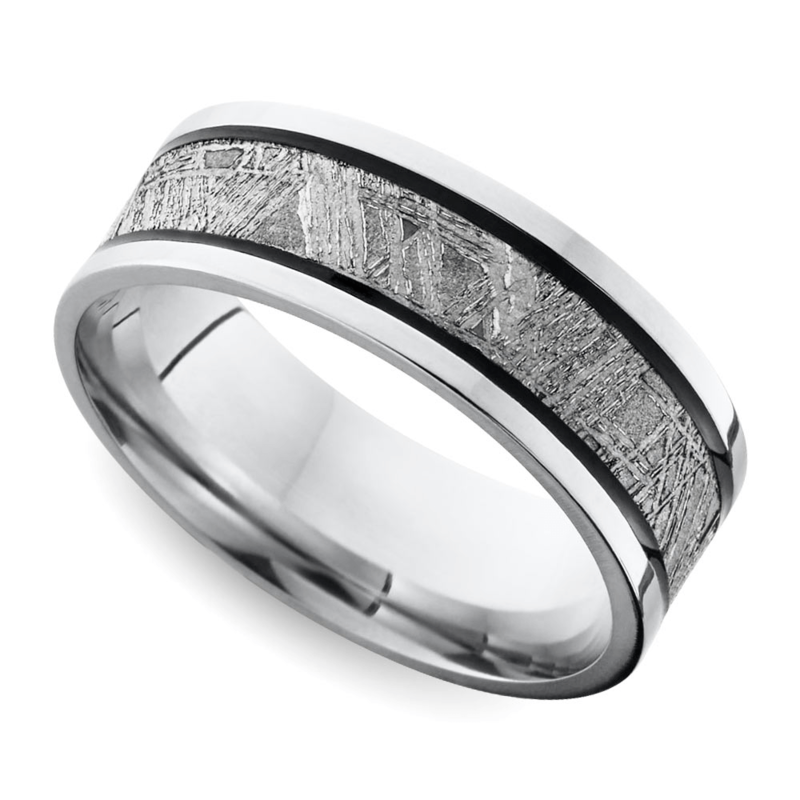 Why not seal your vows with a gorgeous ring, featuring a rose gold base, meteorite inlay, and a princess cut diamond? 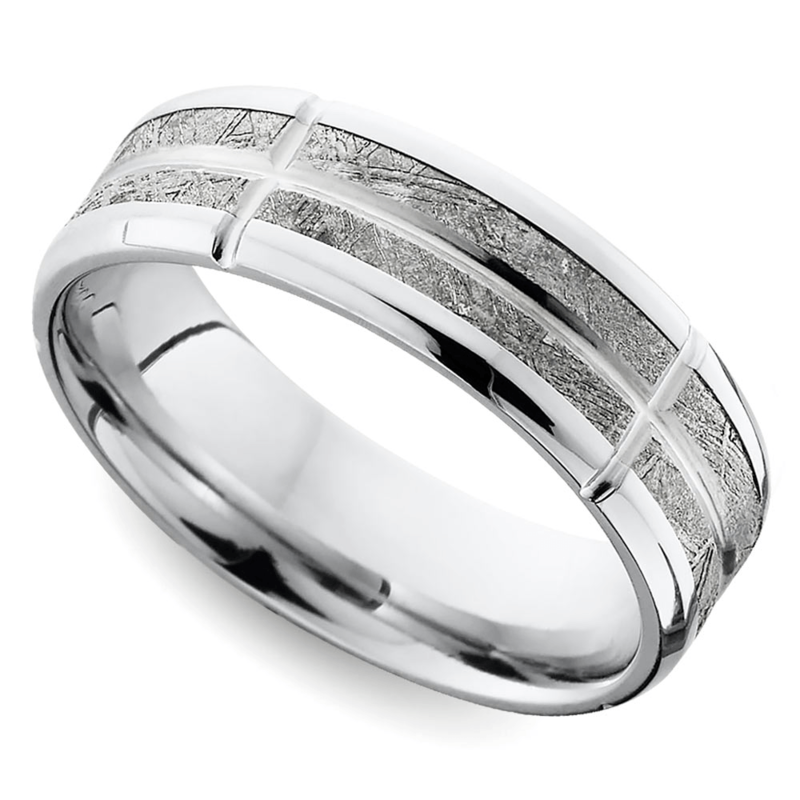 The grooves along the edges of the ring give it a classy, modern look, while the unique features of the ring make it something truly special – perfect for the man who is most special to you. Meteorite rings are unique and show off your husband-to-be’s personality. Check out other meteorite rings and more at Brilliance.com.